A medieval cathedral, the grounds of the all-England club, a dissident priest, and Roger Federer--how does it all relate? A lot of writers have published journals, columns, blogs, etc, about Wimbledon and English tennis, but I feel reasonably confident this is the first one with a dateline that starts in Boston. Boston Massachusetts? Nope, the original Boston. Boston, Lincolnshire, England. It's an old medieval market town in the gorgeous rural farm country 150 miles north of London. And yes, our Boston here in the states is named after it. And why was I there in Old Boston and how could that possibly relate to Wimbledon? Well, strangely, Old Boston is where two of my fondest interests converged. And Nicola was also kind enough to invite my usual tennis traveling partner, Tennisplayer digital still photographer and bon vivant, J. Gregory Swendsen. So the plan was set, and we decided to include a short spree of high living in London as part of the itinerary. 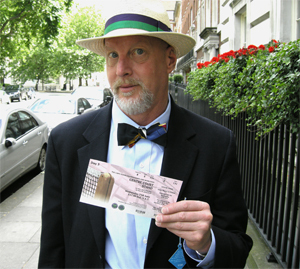 J. Gregory Swendsen with his Center Court ticket. But before the conference, I took a few days to travel north to Old Boston for a very different purpose, to pursue one of my other passions, early American history. Little did I know how it would circle back to tennis in a string of coincidences. If you've read C.J. Jung, the word "synchronicity" kept seeming to apply. Many of the leaders who first settled colonial New England in the 1630s came from Old Boston, or the surrounding areas, including one of the leading intellectuals of the period, a dissident Anglican priest named John Cotton. I had studied his writings in grad school. Then, years later I was stunned to discover I was actually a direct descendent on my mother's side. I'm still puzzling out what that might fully mean. But it was enough to resurrect my interest in John Cotton and his work, and so I went to Old Boston to see the gorgeous old medieval cathedral where he used to preach, and to work on my book: "John Cotton and the American Dream." Look for it in book stores in around 20 years. And here's where tennis started to unexpectedly intermix itself with the other purpose of my trip. On my way into Boston, my taxi passed something called the Boston Tennis Club--and it looked really nice from the road. They say you can see the Cathedral from anywhere in Boston, even from the Har Tru courts at the tennis club. So there was no way I wasn't going to check that out, and I was amazed at what I found. That's where I got my first surprising impression of what is currently going on in English tennis. There is an amazing flood of tennis energy in England right now that you can feel everywhere, from the grassroots, to the high performance coaches at the Lawn Tennis Association, to the members and spectators at the All England Club. The result may or may not be the creation of future English Wimbledon champions--but I hope that it will. 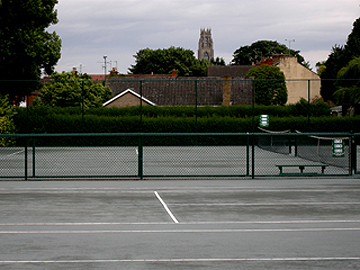 In a town with a population of around 50,000, the Boston Tennis Club has 1,000 members. They have 10 immaculate outdoor all weather courts, 4 gorgeous indoor courts, and 4 pristine har tru courts. Anyone else wish their club in the states had something approaching those facilities? Probably most impressive, the junior program is flourishing in cooperation with the local schools, with around 400 kids playing regularly. That's right 400. San Francisco, where I live, with 10 times that population, can probably claim half that number of real junior players. On yeah, I forgot to mention the total annual membership fees at the Old Boston Tennis Club--around $400 American annually. The people at the club were very down to earth and friendly. I felt welcomed as if I were already a member. I met the manager Frank Cammack, who gave me a complete tour and filled me on the growth of the club and the programs, and I hit twice with a great young pro there, Richard Cooke. But at the club I was still reminded why I'd come to Boston. They say you can see that cathedral where my ancestor preached from anywhere in Boston. Well, check out the picture and you'll see it's true. That's a view of the church from the har tru courts. But that wasn't the only freaky tennis/history connection in Boston. As I got to know people in town associated with the church and the history of the town, it turned out that Frank's brother John Cammack and his wife Judy headed the group studying the connections between the two Bostons and early American history. They were every bit as gracious to me as my new friends at the Boston Tennis Club. And get this, John, at age 80, still plays tennis regularly at the Boston Tennis Club. Beautiful architecture, more religious history, and grass courts for the undergraduates. See what I mean about strange inter-connections? But that wasn't the end of it. My third day in Boston I drove down to Cambridge to see the fabled old university town, and particularly historic Emmanuel College where John Cotton had received his degree in divinity almost 400 years ago in 1612. The whole town is unbelievably gorgeous. Worth the trip and highly recommended on the architectural merits alone. But you know what they had right there in the courtyard of Emmanuel College? Two pristine grass tennis courts, complete with the chalk lines. And the gorgeous young woman undergraduate I asked assured me that, yes, the students actually played on them. Things were getting more surreal. And that trend continued. On my way back to the car, I passed a young guy who looked like a serious player, so I just stopped him on the street. Sure enough he played college tennis for Cambridge. I asked him where the courts were and he said he'd just come from the University's private grass court club. So I couldn't resist that. The back entrance led to some alone time with 8 pristine grass courts. His directions sucked, but eventually I found the courts and although the club was locked up tight, I managed to find a back way in through the cricket pitch. Yeh that's another natural grass surface...So there I was in the glowing light of a late English afternoon, by myself, communing with 8 absolutely perfect, pristine grass courts. Not only that, but someone had left one new Slazenger grasscourt ball out on the court nearest the clubhouse. So I bounced it around, did the serving ball bounce ritual (you have to throw it down a little bit hard to get it to bounce high enough on grass). I got down on my knees, felt the grass with both hands. And yes, it also smells great at close range. Very calming. If you've ever had the privilege yourself, there is something about playing on grass that makes every hit more significant in several ways. The court surface is literally a living presence. You feel it under your feet. You feel the more radical variations in the bounce and speed of the ball. You are more aware because of the uncertainty of what the combination of the surface and your opponent's shot might bring. I've had the privilege of playing on good grass courts a handful of times. Conventional wisdom says grass is "fast," but that's only one part of the truth. When the ball is hit with pace and the grass is fresh, the ball skids and loses less speed than on a hard court. But what makes it seem "fast," at least as much or more than the "skid," is the low bounce. Grass can seem ultra fast because the low bounce gives you a lot less time before the ball bounces the second time regardless of the speed of the shot. So maybe the word "quick" is as good a word, or a better word than "fast." However, the ball doesn't always skid. Sometimes it just bounces. In fact what shocked me was how slow it seems to bounce at times, for example, in a nice, medium paced 4.5 level rally, with the ball hit over the net in a higher, gentle arc. You really have plenty of time on many balls--at least at that level of pace. That makes sense because when the ball comes down into the bounce from a greater height on a steeper angle, the ball not only doesn't skid, the softness of the surface actually robs the ball of speed. Think about just dropping a tennis ball on a putting green. The extreme example is a drop shot, of course, which when well hit, will barely bounce at all. But maybe the real challenge of grass is how all these speeds are mixed, not only by the players, but by the relative wear on different parts of the court. So after my little sojourn in the north, I took the train back down south to London. And we got down to big time tennis without the historical or religious overtones. Uh, more or less. A new English cathedral of tennis: the National Tennis Center. 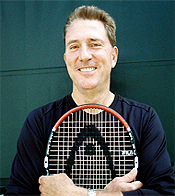 On the Saturday before Wimbledon started I had the privilege of being invited to a high performance coaching workshop at the National Tennis Center by Larry Jurovich, the Lawn Tennis Association's director of coaching education. I walked into the stunning indoor court facility and immediately ran into Paul Annacone, who spends half the year contributing to the LTA effort, and who had just finished what was obviously a serious work out, was dripping with sweat and looking super fit. I said something like "Bloody, frickin' cathedral of tennis you have here." And he looked at me and shook his head and smiled and said in his typically understated way "Yeah it's nice isn't it?" Yes it is. A row of gorgeous indoor plexicushion courts all set over a wood floor base. I'd never seen that before, but it has the kind of gentle give you could only pray every tennis court would have. Then there are the outdoor courts, hard courts, grass courts, red clay courts. The state of the art fitness areas, the office spaces. And that English buzz about tennis permeating the atmosphere. I also had the pleasure of meeting and speaking with Steven Martens and Carl Maes, two other key members of the LTA team, who had previously worked for the Belgium Federation that developed Justine Henin and Kim Clijsters. And yes, everyone I met in on LTA team knew Tennisplayer. And yes, I'm hoping some or all of them will contribute some of their expertise in articles for our subscribers. A chance to work with some leading English teaching pros. Then on Sunday I got to present myself at a second coaching convention put on at another great club on the outskirts of London, this time by TennisCoachUK, the largest independent coaching organization in Great Britain. Working with Executive Director Mike Lynch, we treated the coaches to what was, for most of them, a first look at the high speed stroke sequences from Advanced Tennis. I love showing this footage to coaches, especially for the first time, and the response was tremendous. Almost 6 hours dissecting and discussing the technical elements in the pro game seemed to fly by, including on court videoing of some of the coaches themselves, explaining to how to apply this incredible imagery in coaching and teaching. I guess the evaluations were positive, as I have already been invited back to address their larger convention in November 2009. Thanksgiving in London sounds good to me. So all of that excitement was more than enough to make the trip worthwhile, but starting the next day, we kicked it up to a new level. You've probably read that Wimbledon is smaller than it looks on television and more intimate, and completely magical, and all that is definitely true. Another look around the grounds. But you can't really describe the feeling. You just have to go yourself--and everyone that loves tennis should make the effort at some point in your life. To me Court 1 is especially visually powerful, because of its circular shape--the green roof and the stands surroundingall that pristine grass creates a lot of natural aesthetic pleasure. And what can you say that hasn't been said about Center Court? Well, I can say Nicola had the good tickets. J.Greg and I sat looking directly across the baseline in row H, and on the coveted shady side. The main thing you feel watching the players is how much more fluid and softer and smoother everything seems compared to hard courts. The ball just doesn't get up and all over the players. The sense is that the players are working the ball over instead of the other way around. And yeah Federer's arm on that forehand just looks faster and more fluid than most everyone else's. And Rafa's might not look as fluid, but it definitely looks as fast. Watching them both, you could actually feel that the final was inevitable. You could also just feel the absolutely indomitable will, and the increased fire power, in Rafa's game. And yeah, I had the same feeling that Robert Lansdorp and most everyone else did about the final. There was no way this guy Nadal was gonna be denied. The level of his game had risen to the level of his mind. And lest I give the wrong impression I am happy Rafa won Wimbledon--it just happened a year too early. We'll see if I can recover in time to puzzle out the meaning of the statistics for August. And then there was the Member's Area. This was just too good to be true. Nicola and our other mutual friend and coach, Jane Poynder, also procured the badges that let you enter the sanctuary. It felt as if we were the only American's in there, and maybe we were. You have to wear a coat and tie, and on day one, J.Greg was reprimanded for wearing his KSwiss tennis shoes with his $3000 suit. They let him off with a warning and he showed up his dress loafers thereafter. 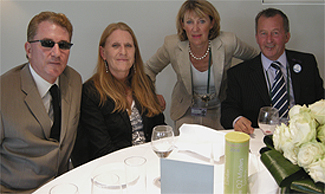 The President's Lunch: that's Nicola and myself with the incoming LTA President Derek Howorth and his wife. You walk up the stairs. There is a cafe, and an outdoor seating area, with, yes, grass. And an overlook to the outer courts. And a bridge that takes you to a private entrance to Center Court. You can drink beer, or Pimm's Cups, or take high tea, or just sit there and observe the privileged members of the English tennis aristocracy. And they are drinking all three in copious amounts, I can assure you. And one more amazing detail. The LTA annual President's lunch. I got to attend as Nicola's guest. Sweating and trying to make small talk with the 50 or so most important people in English tennis, including Roger Draper, the man in charge of the whole player development frenzy. By the way don't wear a black tie in England like I did at the lunch. Unless you are in morning for loved ones. Cool in the states, but a cause for some raised eyebrows at the All England Club. Despite the fashion faux pas, I still ended up sitting with Nicola at a table with the future president of the LTA, Derek Howarth and his wife. And like I said, there is an incredible passion to produce great players in Britain. You could feel it in that room. I'll leave the analysis and the evaluation of the results to others. I'll just applaud the effort.